High gas prices are the talk of the day, leading many car buyers to focus on smaller, more efficient models. For some people, however, bigger isn't necessarily better, but it is necessary. Especially well-suited for large families and those who tow a camper, boat or horse trailer, the 2011 Chevrolet Suburban is a completely modernized version of a genuine workhorse. It's available in light-duty 1500 and heavy-duty, three-quarter-ton 2500 guises and three trim levels: the base LS, the mid-level LT and the upscale LTZ. Inside its cavernous confines is seating for up to nine occupants, cargo space that maxes out at 137.4 cubic feet, and all of the available luxuries and amenities required by families, contractors, and others. If you need the towing capacity of a full-size pickup truck coupled with the capability to seat nine people or fill an expansive dry and secure cargo area, the 2011 Chevy Suburban (and similar GMC Yukon XL) is arguably your best choice. It takes a lot of fuel to haul this much mass up and down the road. With prices at the pump continuing to trend upward, buyers should ask themselves if they need the Suburban's space and utility enough to justify the expense. Chevy has treated its largest SUV to a few tweaks this year, including the availability of new exterior colors, a new 20-inch chrome wheel option and a towing package that now includes an integrated trailer brake controller. Despite being an extremely large SUV built on a truck frame and designed to pull or carry heavy loads, the 2011 Chevrolet Suburban delivers suitable comfortable ride around town and on the highway. Occupants will certainly feel the bumps, but the suspension does an admirable job of absorbing them. All models benefit from capable V8 engines and a smooth-shifting six-speed automatic transmission, though more powertrain noise makes its way to the cabin than drivers may prefer. This technology is also known as cylinder deactivation. In light load situations, such as cruising on a flat highway, power is cut from eight to four cylinders in an effort to conserve fuel. As soon as more power is needed, all eight cylinders are automatically put back to work. The available power-operated running boards, which pop out when a door is opened and retreat when closed, are of considerable help for passengers who find getting into and out of the Suburban to be difficult. Inside the 2011 Suburban is a cabin that includes seating for up to nine passengers, with standard front buckets that can be replaced by a split three-passenger bench seat. The third-row bench is easily accessed courtesy of an available second-row fold-and-tumble feature. That third row is, however, a bit old school in that it cannot be completely folded into the floor; it must be removed if you wish to maximize cargo space. Interior materials are acceptable, if not high-end, and the overall appearance is stylish yet understated. Storage is plentiful, with generous armrest storage and multiple pockets and cupholders. When it comes to vehicles you can buy off your local dealer's lot, there's not much capable of casting a shadow over the 2011 Chevrolet Suburban. It's a full-size SUV, indeed. Modern styling shared with the Chevy Tahoe and Avalanche models allows the body-on-frame rig to appear big, yet refined at the same time. That's due in part to restrained hood and fender bulges as well as precision body gaps that were introduced with the Suburban's last redesign. The whole package rolls on 17-inch wheels, which can be replaced by new-for-2011, dealer-installed, chrome 20-inchers. Chevrolet offers its 2011 Suburban 1500 in three flavors: LS, LT and LTZ, while the Suburban 2500 comes in just LS and LT. Shoppers considering the LS will discover a list of standard features that includes USB and auxiliary input jacks, Bluetooth connectivity, steering wheel-mounted audio controls, and complimentary access to satellite radio service and OnStar's Turn-by-Turn navigation tool. The LT adds upgrades such as leather upholstery, triple-zone automatic climate control, power-adjustable pedals, and a remote-start system, while the LTZ packs on second-row bucket seats and a rearview camera. There's no shortage of optional equipment available for the Suburban, as Chevy offers the 2011 model with a variety of stand-alone features and equipment packages. The list includes a power sunroof, power-retractable running boards, a remote-controlled rear DVD unit with wireless headphones, a blind-spot system and dealer-installed chrome wheels measuring up to 22 inches. For a more aggressive look and added capability, the Z71 Off-Road Package fits the Suburban with off-road tires and suspension components, skid plates, an automatic locking rear differential and a chrome grille. Chevrolet equips its 2011 Suburban 1500 with a 5.3-liter V8 that delivers 320 horsepower when running on gasoline, or 326 horses if the fuel tank is filled with E85 (a mixture of 85 percent ethanol and 15 percent gas). The heavy duty Suburban 2500 packs a bigger punch with its 352-horsepower 6.0-liter V8. Both engines feature Chevy's Active Fuel Management system, which cuts power from eight to four cylinders under light load situations. This technology, along with a standard six-speed automatic transmission, serves to improve the efficiency of Chevrolet's heavy-hauling SUV. 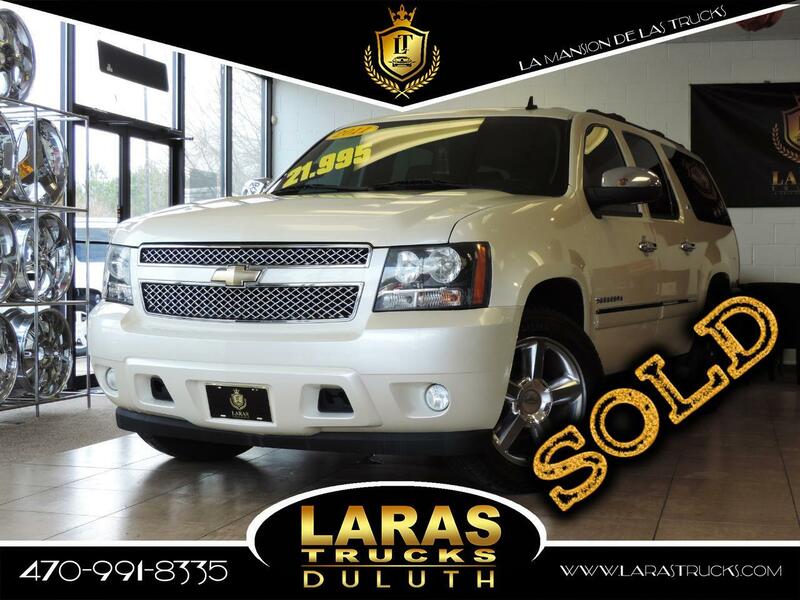 The 2011 Chevrolet Suburban's Manufacturer's Suggested Retail Price (MSRP) starts at a bit more than $42,000 for a rear-wheel-drive LS, while a fully loaded Suburban 1500 LTZ can reach almost $65,000 when fully equipped. Data indicates Suburbans are typically selling below MSRP, but, before starting negotiations with your dealer, we suggest checking the Fair Purchase Price on kbb.com to see what consumers are currently paying in your area. From a resale perspective, the 2011 Suburban is expected to outperform the Ford Expedition EL, match the performance of the GMC Yukon XL, and trail behind the Nissan Armada and Toyota Sequoia.